In the wake of President Trump's decision to remove America from the Paris Climate agreement, you'd be forgiven for feeling a little negative about the future of the planet. This is particularly worrying in light of recent evidence that the Earth’s permafrost—so named, because it remains frozen year round—is melting. Fortunately, the leaders of some countries aren’t hiding their heads in the sand, and they are funding people who are coming up with some astoundingly innovative ideas to keep the planet habitable. Boeri made a name for himself with the Vertical Forest he designed for Milan. 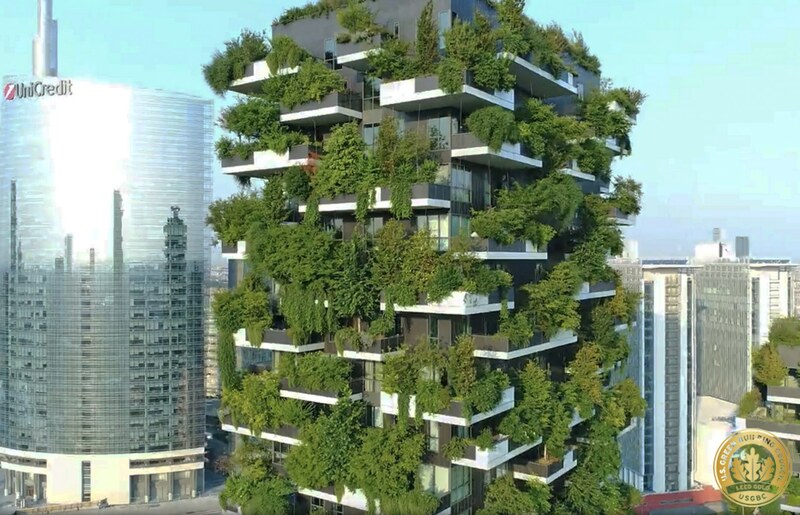 The Vertical Forest consists of two residential towers—110 and 76 meters tall—built in the center of Milan, on the edge of the Isola neighborhood, hosting 800 trees (each measuring 3, 6, or 9 meters), 4,500 shrubs, and 15,000 plants from a wide range floral plants distributed according to the sun exposure of the facade. On flat land, each Vertical Forest equals, in amount of trees, an area of 20,000 square meters of forest. In terms of urban densification, it is the equivalent of an area of a single-family dwelling of nearly 75,000 square meters. The vegetation of the Vertical Forest contributes to the construction of a microclimate, produces humidity, absorbs CO2 & dust particles, and produces oxygen. Boeri is currently designing more Vertical Forests for cities around the world. When Stefano Boeri imagines the future of urban China, he sees green—and lots of it. Office blocks, homes, and hotels decked from top to toe in a verdant blaze of shrubbery and plant life— a breath of fresh air for metropolises that are choking on a toxic diet of fumes and dust. The Master Plan by Stefano Boeri for a new green city that fights air pollution is now under construction in China. The Liuzhou Forest City is commissioned by Liuzhou Municipality Urban Planning. 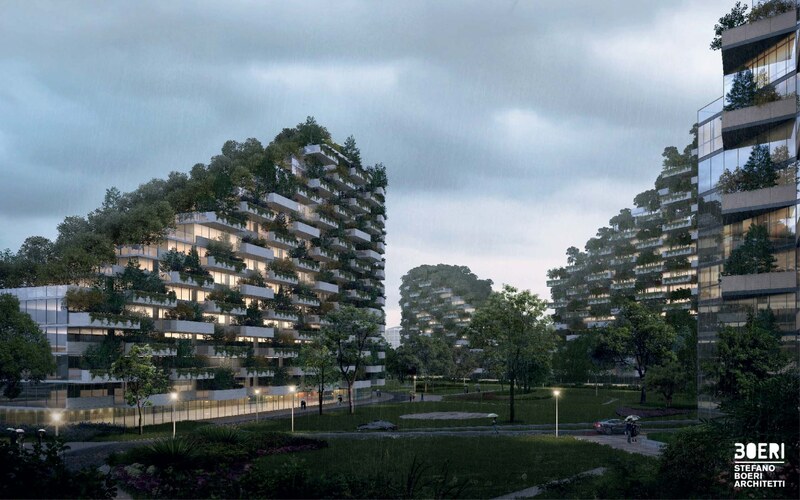 The first Chinese Forest City by Stefano Boeri Architetti is turning into reality. A city where offices, houses, hotels, hospitals, and schools are entirely covered by plants and trees. Once completed, the new city will host 30,000 people, absorb almost 10,000 tons of CO2 & 57 tons of pollutants per year—which is the equivalent of kicking more than 2,100 cars off the road—and produce approximately 900 tons of oxygen annually. 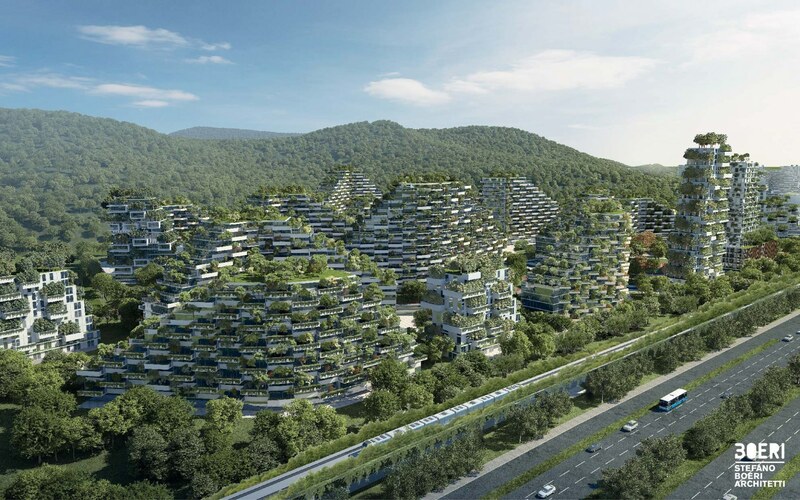 The Chinese government has broken ground on this Forest City with the ambitious plan to have it fully completed by 2020, an urban development that will be covered in plants. 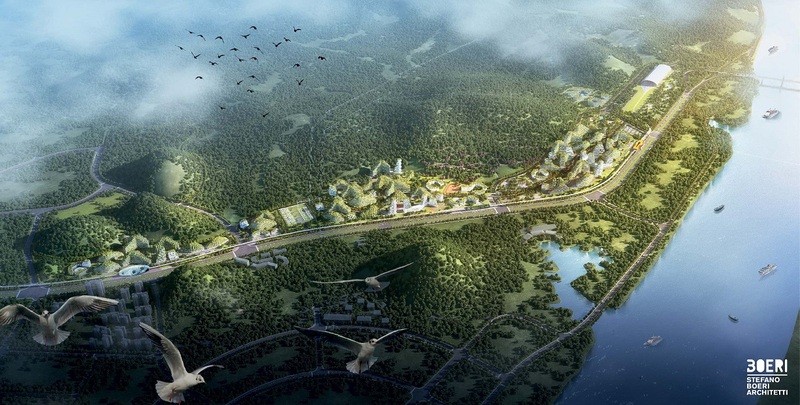 Liuzhou Forest City will be built in the north of Liuzhou, in the mountain area of Guangxi, in the southern part of China, in an area that covers 175 hectares (around 175,000 m2) along the Liujiang River. 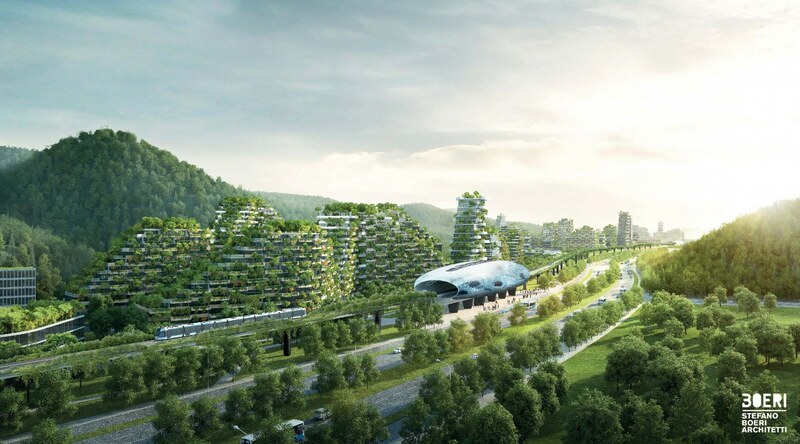 The new green city, entirely wired, will be connected to Liuzhou through a fast rail line used by electric cars and will host various residential areas, commercial & recreational spaces, two schools, and a hospital. Liuzhou Forest City will have all the characteristics of an energy self-sufficient urban establishment: geothermal energy for interior air-conditioning and solar panels over the roofs for collecting renewable energy. The great innovation of Stefano Boeri’s project is the presence of plants and trees over every building, of all sizes and functions. Liuzhou Forest City will host in total 40,000 trees and almost 1 million plants of over 100 species. The diffusion of plants, not only in the parks and gardens or along the streets, but also over building facades, will allow the energy self-sufficient city to contribute to improve the air quality (absorbing both CO2 and around 57 tons of fine dust per year), to decrease the average air temperature, to create noise barriers and to improve the biodiversity of living species, generating the habitat for birds, insects and small animals that inhabit the Liuzhou territory. For the first time in China, and in the world, an innovative urban settlement will combine the challenge for energy self-sufficiency and for the use of renewable energy with the challenge to increase biodiversity and to effectively reduce air pollution in urban areas—which is really critical for present-day China—thanks to the multiplication of vegetable and biological urban surfaces. For one, China is building 285 more eco-cities (no, I’m not joking). China is entering the world stage as a renewable energy powerhouse and is trying to create urban areas that reflect that fact. They are now the biggest manufacturer of solar panels and wind turbines, has the biggest hydro-power production capacity, and has the potential to be a significant player in biomass and geothermal energy supply. China has also hired Boeri to build them their own vertical forest. Nanjing Green Towers, located in the Nanjing Pukou District (an area destined to lead the modernization of southern Jiangsu and the development of the Yangtze River economic area), the two towers are characterized by the interchange of green tanks and balconies, following the prototype of Milan’s Vertical Forest. Along the facades, 600 tall trees, 500 medium-sized trees (for a total amount of 1,100 trees from 23 local species), and 2,500 cascading plants and shrubs will cover a 6,000 square mile area. A real vertical forest, contributing to regenerate local biodiversity, that will provide 25 tons of CO2 absorption each year and will produce about 60 kg of oxygen per day. Check out Boeri’s other urban forestry projects to save the planet here. Are you interested in green tech? Fill out the form below to let us know what you think. Do you have old electronics lying around the house? For those of you who don’t know, it’s illegal to throw them out in the trash—not to mention being super bad for the planet (making you a bad person). Bring them into the shop, and we’ll recycle them for you. And while you're here, check out our free-range refurbished computers.